Veasna Kay grew up in the rural Cambodian region of Kampong Cham. The youngest of seven children in a family of rice farmers he was expected to work in the fields, however would sneak back into the kitchen to help his mother prepare meals for the family. He loved to catch crabs, fetch water and pick vegetables from the family’s garden, then watch his mother transform these humble ingredients into delicious meals. It wasn’t long before he began helping out in the kitchen and learning his mother’s secret recipes. Upon moving to Phnom Penh in his teens, Veasna worked in many kitchens all over the city, picking up new skills and inspiration. Naturally, he was top of his cooking class, and eventually he came to run the kitchen at Phnom Penh’s arthouse cinema The Empire; his dishes beloved by expats and tourists alike. After 5 years of running the Empire’s kitchen, Veasna decided to take on a new challenge; to share local cuisine with tourists to Cambodia with small cooking classes, and private dining experiences. His recommended recipe is Aubergine with pork, however the Caramelised pork and egg is a close runner up. If you’d like to dine with Veasna, or enjoy one of his cooking classes, contact us to make a booking. Veasna Kay grew up in the rural Cambodian region of Kampong Cham. The youngest of six children in a family of rice farmers he was expected to work in the fields, however would sneak back into the kitchen to help his mother prepare meals for the family. Upon moving to Phnom Penh in his early 20’s, Veasna worked in many kitchens all over the city, picking up new skills and inspiration. 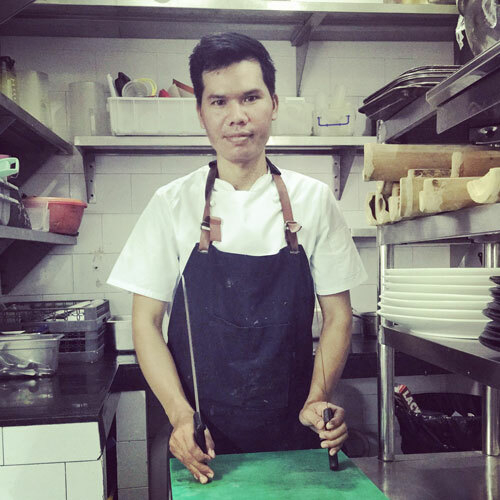 Naturally, he was top of his cooking class, and eventually he came to run the kitchen at Phnom Penh’s arthouse cinema The Empire; his dishes beloved by expats and tourists alike. When he’s not busy in the kitchen, or filming new video recipes, Veasna enjoys relaxing with his husband Niall in their Phnom Penh apartment.